Hope springs eternal for Shauna! 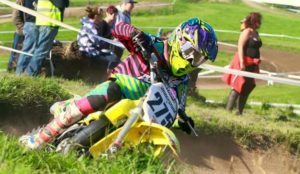 Whilst many motocross riders can be judged by their podium places or championship standings, a 15-year-old competitor from Mid Wales is proving that success can be measured in another way. 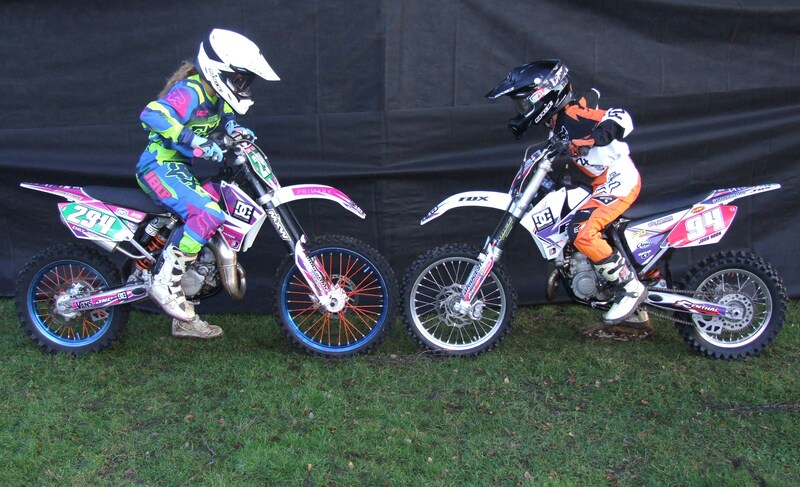 Shauna Hope, from Rhayader, not only met her best friend through the sport, but she is also a much more confident girl thanks to her experiences in the Bridgestone BSMA, where she is improving all the time in the Big Wheel 85 category. Shauna’s mum Sarah said that her daughter is able to express herself out on the track and is enjoying every second of competitive action. “As soon as Shauna turned seven she wanted to ride a bike,” said Sarah, whose husband Wyn raced for many years. Shauna met her best friend Emily Noon through the Bridgestone BSMA and the pair spur eachother on at each round of racing. “They met through the Bridgestone BSMA and they are the best of friends. They are both quiet girls, but they bring the best out of eachother which is nice to see,” Sarah added. The Llandrindod Wells High School pupil is one of three Hope daughters to have competed in the sport, with eldest Hannah (aged 22) regularly impressing and Jade (17), also adept at the sport. And despite her high octane experiences out on the track – with much improved times compared to her first season of Big Wheels competition last year – Shauna refuses to shout about it from the rooftops. That’s not her nature. “She doesn’t really tell her mates at school about her racing. She just keeps it to herself and looks forward to the next race. If there’s two things that can be guaranteed at the forthcoming Bridgestone BSMA weekend at Warmingham Lane, then it’s that Matthew Mears will be showing great promise – and his mum will be embarrassing him afterwards! As the 12 year-old prepares for another tilt in the Bridgestone Small Wheels category, most onlookers will be able to hear mum Lorraine even if they can’t see her, as she cheers his every move with husband Nigel. The Cinderford youngster – whose uncle Chris Grindle is currently impressing in the AMX Open – is loving life in the extremely competitive Bridgestone class and is making steady progress since his opening outing at Brookthorpe. Lorraine said: “I am the stereotypical embarrassing mum and I make no apologies for it! I find the best possible vantage point at each track and I cheer Matthew’s every move. Matthew has had something of a baptism of fire in the Small Wheels class, finishing near the back of the pack to begin with, only to work his way up to a season-best finish of 24th more recently. Lorraine added: “We entered him into the Bridgestone series in the knowledge that he might well struggle to begin with. We wanted to see if the better riders could drag him along and we hope he can learn from them. “He is absolutely loving it and is learning all the time. His best finish is 24th and we are exceptionally proud of him for achieving this. It is no mean feat in his first year amongst so many talented riders. The Forest High School youngster is somewhat unique amongst his friends in dedicating his spare time to motocross, having first sat on a bike as a six year-old. His uncle Chris Grindle was the catalyst behind that, inspiring Matthew from his exploits on the track where he is still in fine form today, currently lying in third place in the AMX Open standings. Lorraine added: “I remember Matthew turning six on the Tuesday and competing in his first race the following Sunday. Nigel and Lorraine would also like to thank Truwater Training, DBMX, 2UNESTOKE and Shaun Morton for Matthew’s new kit. 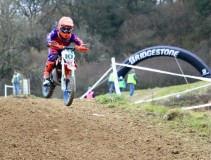 Competing in the Bridgestone BSMA Nationals against older, more experienced boys might be a bit daunting for some nine-year-olds, but in his first ever season in the Juniors, Harry Beach is loving every second. Many nine-year-old boys living in the North Worcestershire area might be happy playing football by the riverside and spending their hard earned pocket money at the fun fair. But for Warley Wasp Harry Beach, such entertainment was never going to satisfy his high-octane sense of adventure, with a seat on a motocross bike way more appealing. 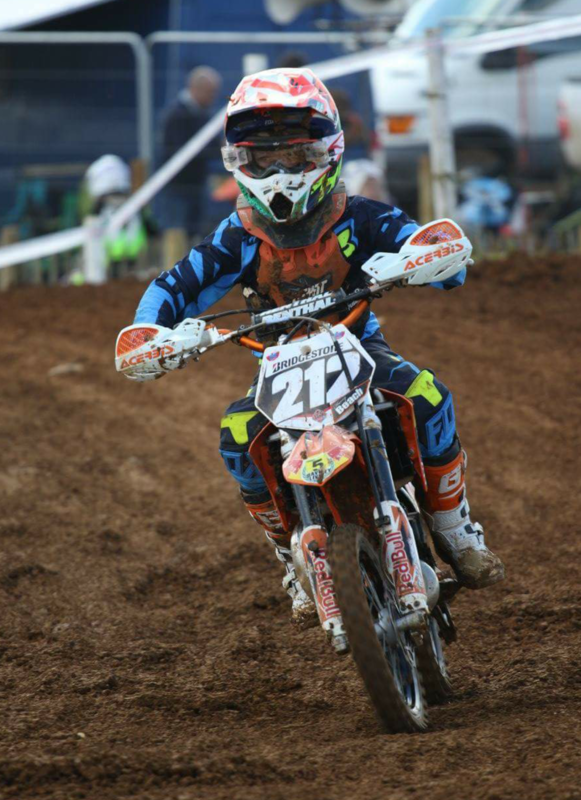 The youngster is preparing for his third Bridgestone BSMA race weekend in the Nationals at Fatcats in Doncaster and despite being so new to competitive action against older competitors, he is beginning to make his mark. Dad Steve said: “He is doing ever so well and we’re all really proud of him. He is ever so stylish, smooth and determined around the track and is showing a great deal of potential. Harry has generally finished in the mid-pack during the opening two rounds of the season, but has shown particular promise in recording his best finishes in the final races, which bodes well for the future. The youngster’s love for motocross began as a four-year-old, when his granddad bought him a Yamaha PW50 for Christmas. If anyone has any difficulties in recognising Harry on race day, then they should look for his proud and passionate granddad, Andy Grimes, who can be seen cheering his every move. “Harry is his grandad’s shadow. Whatever his grandad does, Harry will follow, so he was always going to end up on a bike as his grandad also used to race. Steve echoed the sentiments of countless parents across the UK when he admitted to being a bit tired after race weekends. Emily and Josh Noon live in Worcestershire, both racing with the Cotswold Club and are very passionate about motocross, both their own competing and also watching their idols on TV and in real life. 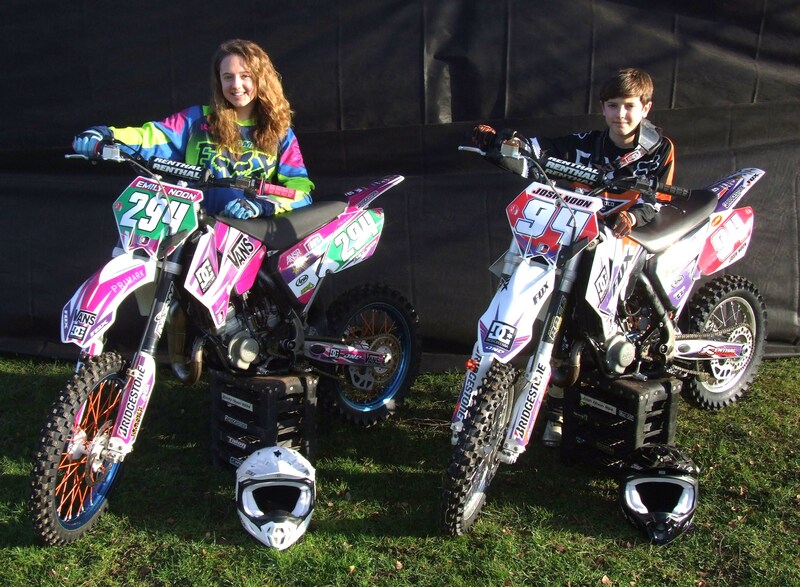 Emily is 13 as the 2015 season starts and completed her third year of racing in 2014 on a KTM in the SW85 class. Emily’s highlights from 2014 in the SW 85 class were achieving 19th overall in the Bridgestone BSMA Clubmans Series and first girl, 8th Overall in the Cotswold Club Championship, 5th Overall in the Rhayader Club Championship, 24th in the BSMA Finals and first girl. Her self confessed greatest weekend of her life was when she raced at her best for 4th overall in the UK Girl’s Nationals at Upton Court. Emily’s strong point are her starts, often powering through the first few turns mixing it with the front runners. Emily’s low point of 2014 was watching her brother injure himself on day one of the May two day Cotswold race meeting at Longdon, and then crashing herself on day two in a first lap pile up, burning her arm from a spinning wheel whilst trapped underneath. Her courage and determination showed through as she refused to get into the ambulance for treatment unless she was assured the race re-start would not happen without her! The scarring remains as a reminder of her tough character. Outside of motocross, Emily enjoys athletics, netball, hockey and football. Her role models in life are Jolene Van Vugt, Livia Lancelot & Ken Roczen. She moves up to the BW85 class for 2015 on her KTM to compete in the Rhayader and Cotswold club championships, the BSMA Clubman’s Series and the Girl’s National event in September. Josh is 11 as the 2015 season starts and completed his third full year in 2014, on a KTM 65 in the Juniors. Josh had a tough year in 2014, picking up a horrible double break of his left forearm in an unfortunate first corner pile up at the May Longdon two day, and the resulting ten weeks away from a bike meant he missed out on two of the Bridgestone BSMA Clubman’s rounds and saw the eighth position he held after the first three rounds slip away as he watched from the sidelines. Despite this setback, Josh came back fighting, and took 6th overall in the Cotswold Club Championship, 7th overall in the Rhayader Club Championship, and despite only jumping back on a bike the week before after his arm break, he managed 12th overall at the BSMA Finals. He then rounded the year off by winning the Cotswold Winter series to finally regain his confidence and leave the 65 class on a high. Outside of motocross, Josh enjoys football, playing for his local team Crowle Searchers, and also athletics, swimming and still endlessly pushing a toy motocross bike around the furniture accompanied with lifelike noises wherever he sits! He moves up to the SW85 class for 2015 on a KTM to compete in the Rhayader and Cotswold club championships and the BSMA Clubmans Series Although they both share the same passion on a bike, just like all brothers and sisters, once off the race track and back home, they’ll squabble over anything. Good Evans! Bridgestone backing motocross-mad Morgan! 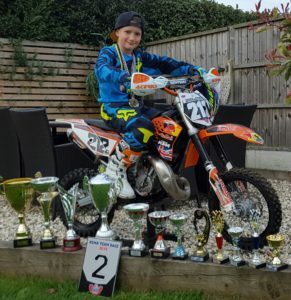 A 10 year-old sporting starlet from Himley is gearing up for 2015 in the best style possible, after Bridgestone fuelled his motocross ambitions with a high-profile sponsorship – just two years after he chose his bike over a youth opportunity with Wolverhampton Wanderers. 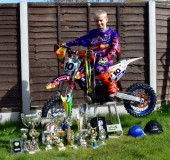 Morgan Evans has been behind the throttle of a bike since the age of seven and has grabbed the attention of the world’s largest tyre manufacturer following an amazing 12 months, when he won three championships with his Warley Wasps motocross club. Bridgestone’s backing, featuring a supply of premium tyres and eye-catching clothing, represents a degree of justification for Morgan, who was given the ultimatum of football or motocross after being invited to train at Wolves’ Compton academy. Dad John said: “Bridgestone approached us over Christmas and it was an unbelievable feeling to receive the phone call. “They said they had been really impressed by Morgan in 2014 and wanted to sponsor him this year to underline their commitment to young talent in the sport. John said that Morgan’s decision to walk away from football was a surprise, but a pleasant one nonetheless. “He was always into his football and was a very good little player. 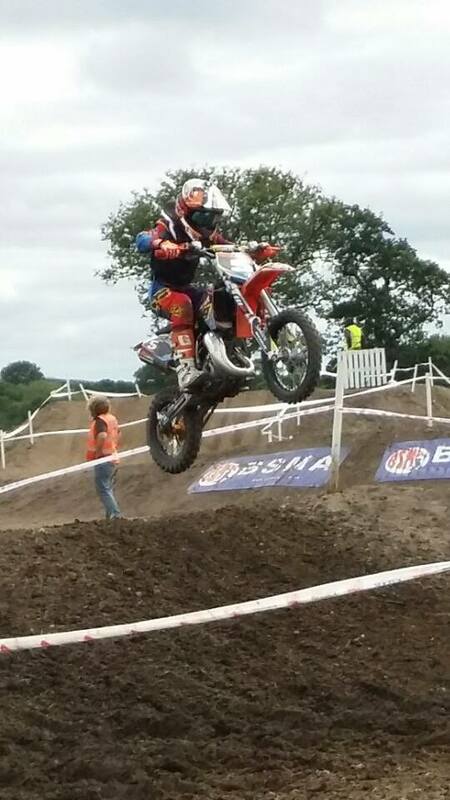 But after he trained at the academy with a motocross induced injury from a day or two before, he was given a choice. “It was the Wolves or motocross as Morgan wouldn’t be allowed to put himself at risk by riding at the same time. Morgan’s recent achievements are even more remarkable considering he missed the whole of 2013 with a badly broken arm when crashing, to perhaps underline the point that his football coaches were making. John added: “It was a really upsetting time when he picked up the injury but like the old adage, he eventually got back on the saddle again after falling off and was fine. Having learned to ride without a single lesson, Morgan is now looking forward to a big 2015 with Bridgestone’s backing. Jack the lad to give Bridgestone some swagger! 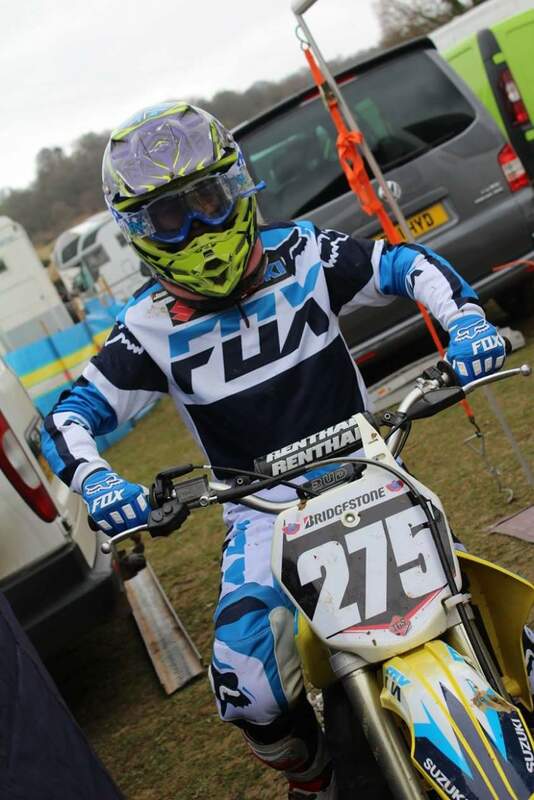 A talented young motocross rider from Gloucester is looking forward to the new season in inflated spirits, after the world’s largest tyre manufacturer backed his bid for national success. Bridgestone has been so impressed by the ‘consistently brilliant’ performances of Jack Timms throughout 2014 that the brand has decided to put its name behind him in his two-wheeled title tilt next year. 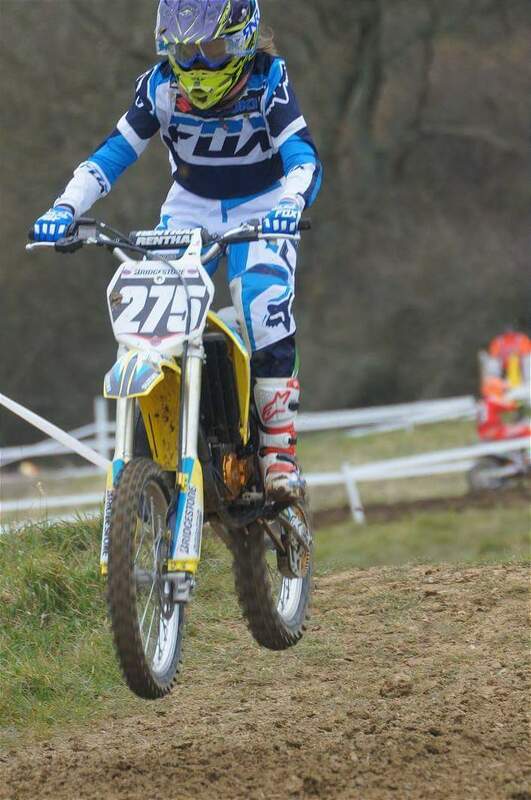 The Whitminster youngster was in scintillating form during this season and narrowly missed out on the British Schoolboy Motorcycle Association (BSMA) Clubman’s Series, in between a string of high profile wins on a national level. His progress alerted the attentions of Bridgestone, who approached the 20 year-old with a sponsorship offer, which includes a season’s supply of its premium BATTLECROSS tyres, along with clothing and equipment. The deal underlines Bridgestone’s commitment to the world of motocross, which the brand is looking to gain even more traction in following the recent unveiling of a coveted range of tyres. Jack said: “To catch the eye of Bridgestone in the first place is a big thing for me, but to be approached with a sponsorship is even better. Jack has been racing since the age of six and dedicates many of his race wins to his father, without whom the bumpy road to success would not have been possible. That’s not to say that his progress hasn’t been stunted by one or two obstacles along the way. He added: “I’ve broken one of my legs, both of my wrists and a fair few ribs since I first started. Half of my teeth are false and I needed a skin graft on my wrist, too. Bridgestone’s partnership with Jack arrives on the back of a hugely successful sponsorship of 17 year-old Rob Yates of Redditch, whose form has rocketed since the two teamed together. Bridgestone’s training development manager Mark Fereday said: “We are thrilled at the prospect of working with Jack. He is a supremely talented young rider who has been consistently brilliant for some time now. Bridgestone’s decision to sponsor Jack coincides with a renewal of its title sponsorship of the BSMA’s Clubman’s Series in 2015, which is expected to be a grander spectacle than ever when the action recommences. All activity underpins the tyre manufacturer’s efforts to get its X30 and X40 products to a wider audience, both of which were launched in 2014 and received a glowing endorsement by seven times Dakar Rally competitor Mick Extance. Mark added: “We feel that the future has never been brighter for us in the world of motocross. There are up to 100,000 motocross tyre sales in the UK alone per year and we have long felt that a high performance tyre – which is competitively priced – will be a compelling option for riders of all abilities. ZAC IS A MEMBER OF WEM MX CLUB AND HAS BEEN RIDING FOR TWO YEARS, ZAC STARTED OFF ON A SMALL WHEEL AND MOVED UP TO BIG WHEEL THIS SEASON. ZAC HOBBIES : SHOOTING AND CHILLS OUT ON HIS PS3 PLAYING MX GAMES, WATCH MX TELEVISION AND FAVORITE FILM HAS GOT TO BE BOX SET OF BENIDORM.